Deva (said to be pronounced: day' va) is a Sanskrit word which can be translated technically as "intelligent agent," or literally as "shining one." Mythologically, there is a "god" or "goddess" connotation to this term. In ancient literature every tree, flower, river, and mountain was represented by a deva in charge of organizing its intelligence. Cities and other large groups of people were also represented by devas. In modern terms the word deva can also be understood to mean "organizing intelligence." According to the Wisdom teachings, devas are the great builders and maintainers of form. Esoterically, a deva is an angel, a god, or a celestial being ~ whether good, bad, or indifferent. Devas are divided into many groups and are called not only angels and archangels, but also lesser and greater builders ~ the builders of the system. through this honor and love you will attain the supreme good. by the devas without offering selfless acts in return is a thief. As a whole, devas are on the evolutionary path, the upward way. Deva evolution parallels that of the human kingdom, and is responsible for building all forms in nature which consciousness uses as a vehicle ~ from a flower, to a human being, to a planet. teachings of Alice A. Bailey and Lucille Cedercrans. 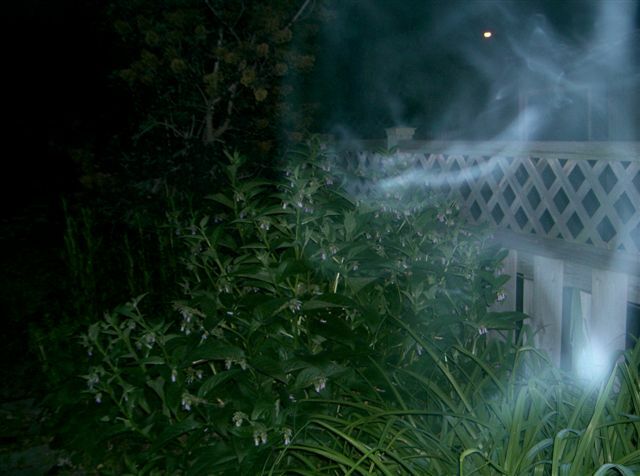 The ghostly vapors look like a Garden Angel / Deva offering a gift to the plants.